On Sunday (9 August) I did something for the first time. I went to a ‘con’ or convention: the Nine Worlds Geekfest 2015. How did this happen? A few months ago, Lydia Nicholas from Nesta approached me with a fascinating project. In collaboration with Joshua Ryan-Saha, the Assistant Manager of the Longitude Prize, she had asked authors to write short stories about everyday life in a post-antibiotic future. 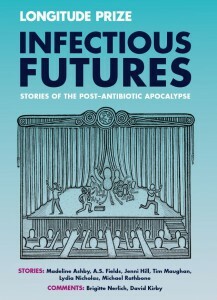 Six stories were eventually selected for a little anthology entitled Infectious Futures. Lydia asked some people to write comment pieces on these stories. Eventually, David Kirby, an expert on science/fiction interactions wrote one comment and I wrote another in collaboration with Matthew Clarke who loves (and knows about) genetics and sci-fi stories, while I generally just love to talk about genetics and sci-fi stories. 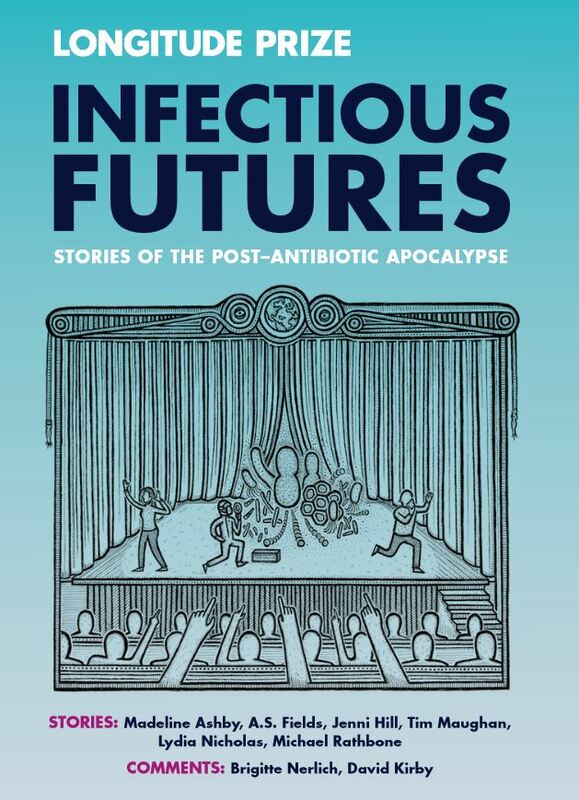 To launch the anthology, Lydia invited a panel to debate the issue of AMR or ‘antimicrobial resistance’ (or as the Wellcome Trust now advises us to call it: ‘drug resistant infections’) at Nine Worlds. 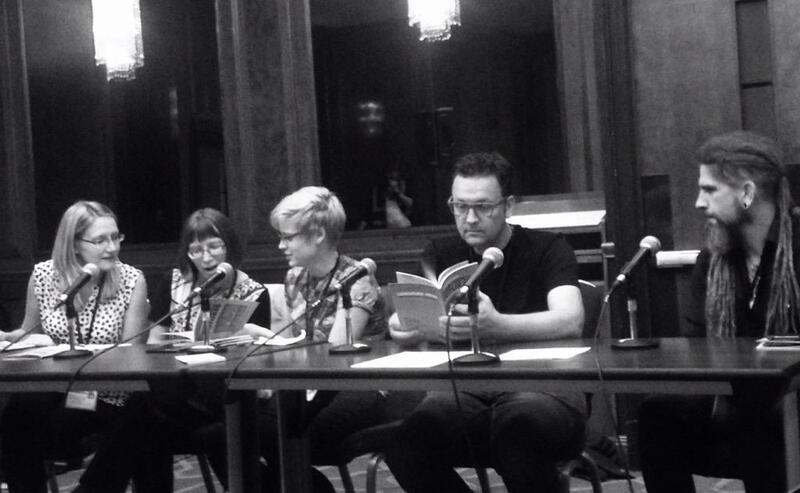 The panel was part of a ‘track’ devoted to the ‘Apocalypse’. 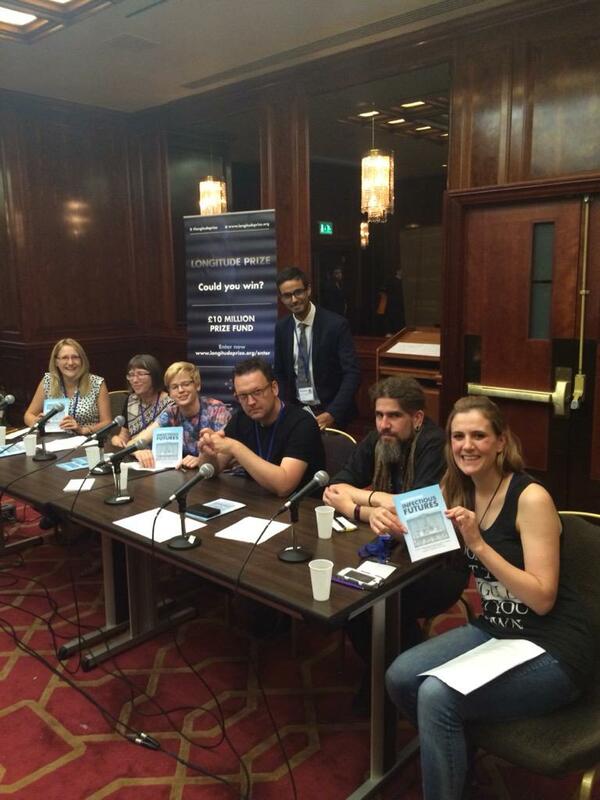 There was a really nice mixture of people on the panel. Alongside Lydia herself, there were Jessica Blair, a microbiologist studying antimicrobial resistance at the Institute of Microbiology and Infection at the University of Birmingham and Champion of Antibiotic Action, Scott Smith, a Critical futures expert and founder of Changeist, Paul Graham-Raven, a freelance writer who also carries out research into a future with and without infrastructures, and myself. The panel was introduced by Josh and one of the authors, Jenni Hill (a commissioning editor for Orbit an fan of science fiction and fantasy novels), read her story: “They want to live too”. In the black and white picture above, you can see the panel pouring over the anthology which had just arrived fresh from the printers (from left to right: Jessica, Brigitte, Lydia, Scott, Paul). If you wonder what face I am pulling… I was saying something like: “Oooh, I love the illustrations!” The illustrations for each story were designed and produced by Mike Stout and they are fantastic. They really encapsulate the essence of the stories. So, read the stories and then go back to the illustrations and you’ll see what I mean. The brief for the panel discussion was to discuss the following themes with the audience: How does apocalyptic fiction interplay with real-world responses to potential catastrophe? Do narratives of explosive and end-times undermine efforts to recognise and deal with the slow, exhausting, complicated reality of threats to our species and society? We each had to bring a catastrophe we had been working on; so I brought MRSA and climate change. We also had to think about an inspiring story that had a positive impact on changing public attitudes, awareness or behaviour about an issue. Finding one was extremely difficult and, I think, in the end we gave up. The panel debate was lively and circled around really complex issues of how to connect the local and the global, the distant future and the here and now, futuristic imaginings of a fast apocalypse with the reality of a ‘slow apocalypse’, the fragility of complex systems (with Paul introducing Kerplunk as a metaphor), and the thorny issue of how to engage policy makers with the threat of antimicrobial resistance. We noted that much progress had been made, that research funders and government officials were taking notice, but that more needed to be done to connect the science, policy and public spheres around this issue. Paul Graham-Raven made an interesting comment, which initially surprised me but then made sense: We need more dystopian stories, not less, in order to counter the spread of overly-optimistic stories about mankind’s technological prowess and mastery over the future. On the way back from the convention a thought occurred to me: We need more AMR, and by that I mean not AntiMicrobial Resistance, but rather more Apocalyptic Messaging Research. When do apocalyptic stories work? When don’t they? Do they work better for some issues (AMR) than others (climate change) or do they work equally well/badly everywhere? There is lots to think about. In the meantime, read the stories, think about what a lack of antibiotics might mean in everyday life in the future and follow the progress of the Longitude Prize. The Longitude Prize is a science challenge with a £10 million prize fund which aims to conserve antibiotics for future generations and revolutionise the delivery of global healthcare. The Prize commemorates the 300th anniversary of the Longitude Act of 1714, when the British government challenged the public to solve the greatest scientific challenge of the time, determining longitude at sea. In partnership with the BBC, the public voted for one of six of the biggest global challenges today, and chose AMR/antimicrobial resistance/drug resistant infections to be the focus of the Longitude Prize in 2014. Infectious Futures is part of efforts to make the issue of AMR public. One of the members of the Longitude Committee, Roger Highfield, has written a forward to the collection of stories and comments. Have a look! PS Thanks to Neil Chadborn for alerting me to: Ruth Levitas (2013). Utopia as method: The Imaginary Reconstitution of Society (Palgrave). And here are two more posts: One by Scott Smith and one by Jessica Blair!